The donors preoccupied with the scandal are predominately in Franken’s corner, according to a report from Politico declaring that the matter "haunts Gillibrand’s 2020 chances." The report comes after Gillibrand was blackballed by mega-donor George Soros, who accused the New York senator of stabbing Franken in the back to improve her 2020 chances. After weeks of the scandal unfolding at the end of last year—starting with a photo of Franken with his hands over a woman’s breasts during a USO trip and leading to a half dozen separate allegations—Gillibrand called on Franken to resign. Other female senators joined her, Franken resigned the next day, and it seemed like par for the course in the MeToo era. But many powerful Democrats have not moved on and are excoriating Gillibrand as "opportunistic" for taking down a progressive darling who took the fight to President Donald Trump. "He was one of our best weapons against this administration, his presence on these committees. [Gillibrand] did the damage that Republicans could not do themselves," said a guest at a Bay Area meeting of Democratic donors, who was quoted by Politico. "There were other people at this event who were saying the same thing. They said, ‘Absolutely, I will never do anything for her.’"
Despite the string of negative press Democrats received in November and December last year over the scandal, donors such as Susie Tompkins Buell, cofounder of the North Face, argue Gillibrand rushed to judgment. Rather than ruining her image of Franken, she claims the episode "stained [Gillibrand’s] reputation as a fair player." "I do hear people refer to Kirsten Gillibrand as ‘opportunistic’ and shrewd at the expense of others to advance herself and it seems to have been demonstrated in her rapid treatment of her colleague Al Franken," she said. "I heard her referred to as ‘she would eat her own’ and she seems to have demonstrated that. I know [Gillibrand] thought she was doing the right thing but I think she will be remembered by this rush to judgment." Buell went on to say, without naming any particular senators, that Gillibrand’s female colleagues regret joining her call for Franken’s resignation. "I have heard some of her women colleagues regret joining her," she said. Despite Congress’s reputation for failing to adequately investigate its own members, many said Franken did enough by calling for the claims to be vetted. By pushing him out before an investigation was completed, those donors argue, Gillibrand crossed the line. 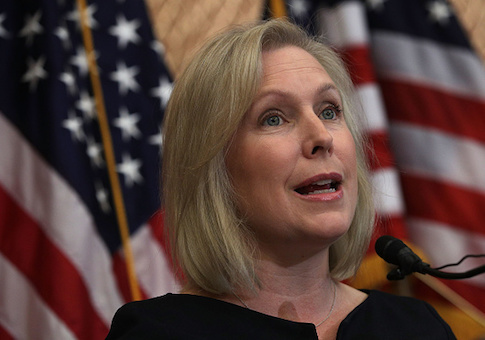 A powerful Manhattan donor in the "Majority Trust" of the Democratic Senatorial Campaign Committee claimed not to be able to donate to or even vote for Gillibrand again. "I could stay on the phone all afternoon talking about this," the donor said. "Let me tell you how strongly I felt about it — I didn’t even vote for her in the recent election. I left it blank." This backlash against Gillibrand is arguably just a donor-class phenomenon, however. She won re-election this year with more votes than New York’s Democratic Gov. Andrew Cuomo, and it’s notable that Franken’s successor, Sen. Tina Smith (D., Minn.), won in 2018 by a larger margin than Franken ever did.